In my last post, I highlighted an innovative program in Toronto which brings a mobile produce market to communities who lack access to affordable and healthy food. 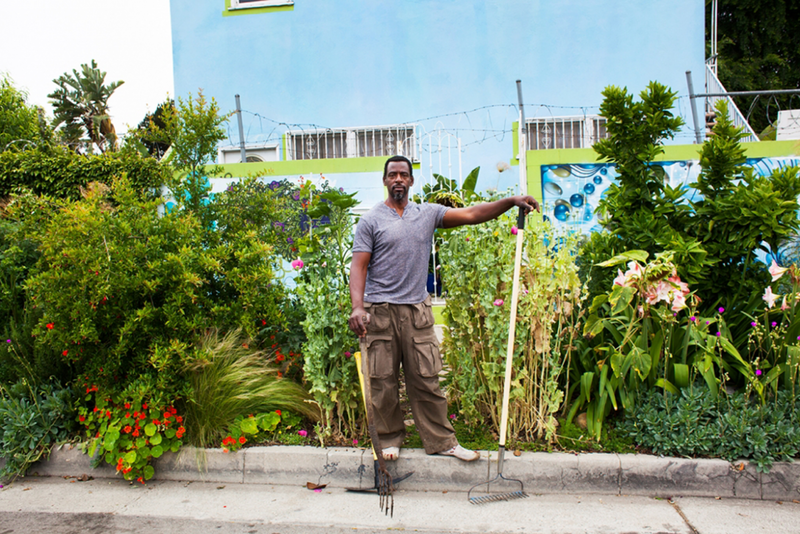 In an effort to address healthy food access in similarly underserved neighborhoods across the US, some community residents have literally taken action into their own hands by transforming underutilized and sometimes unlikely patches of land into “guerrilla” gardens. 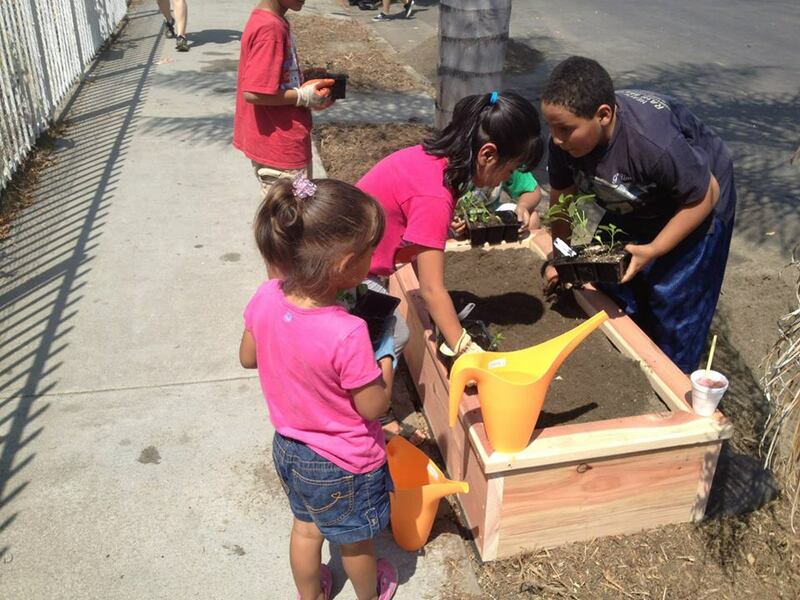 Trees, wildflowers, herbs, fruits and vegetables pop up in vacant lots, alleys, tree pits and even parkways (the planted strip of land between the curb and the sidewalk), providing aesthetic value, helping to oxygenated the air and clean the soil, as well as providing families with an opportunity for healthy eating. Parkways are often owned by a city but the responsibility for maintenance falls on the adjacent homeowner. These spaces have a lot of potential for urban gardening because they are right outside of a house or apartment building and are a manageable size. Some parkways go ignored, some become planted, and others become community resources. 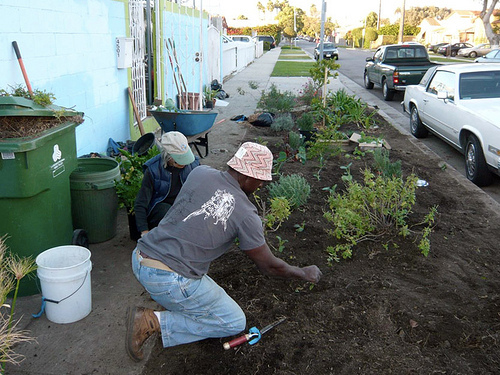 Prior to a 2013 amendment to the City’s “Residential Parkway Landscaping Guidelines”, it was illegal to plant fruits and vegetables in parkways, but due to the activism of Mr. Finley and many others, the LA City Council decided to make an exception for vegetable gardening. While this news was a step in the right direction for urban gardeners and community health advocates, the permit to plant anything other than grasses and certain shrubs, still carried a cost-prohibitive $400 price tag. But just this week, the LA City Council voted to waive the $400 fee for parkway gardens (excluding fruit trees). The City Council will still have to define the parameters of the law (regulating garden height and addressing concerns such as safe passage for pedestrians) and the ordinance will be subject to final Mayoral approval, but waiving the fee will be a significant win for advocates and paves the way to increase the opportunity for residents to bring fruits and vegetables in to their neighborhoods without the worry of fines hanging over their heads. In an essay for The Guardian newspaper after the unfortunate celebrity photo leak of 2014, author Roxane Gay detailed why this sad and criminal act only reinforced an ongoing vulnerability women and other marginalized populations continue to experience in our society. She writes: “…privacy is a privilege. It is rarely enjoyed by women or transgender men and women, queer people or people of color. When you are an Other, you are always in danger of having your body or some other intimate part of yourself exposed in one way or another. A stranger reaches out and touches a pregnant woman’s belly. 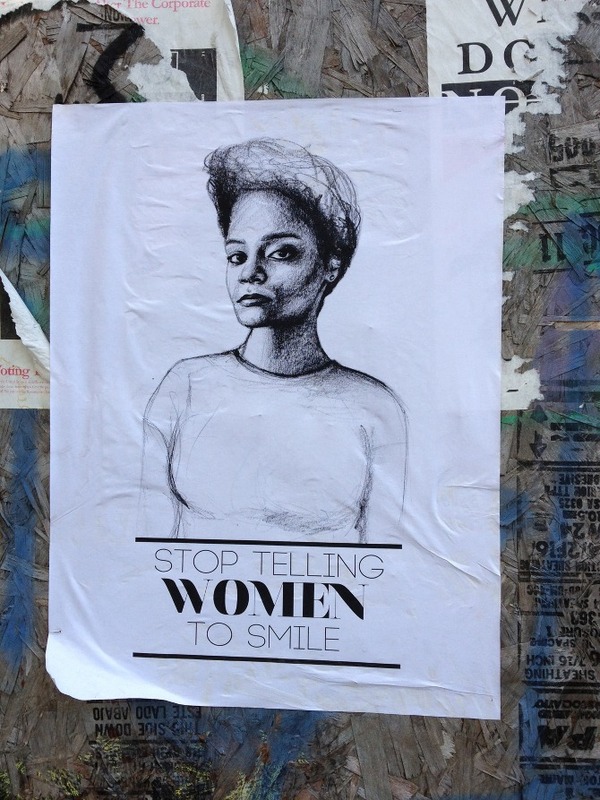 A man walking down the street offers an opinion on a woman’s appearance or implores her to smile. A group of teenagers driving by as a person of color walks on a sidewalk shout racial slurs, interrupting their quiet.” She continues: “For most people, privacy is little more than an illusion, one we create so we can feel less vulnerable as we move through the world, so we can believe some parts of ourselves are sacred and free from uninvited scrutiny.” She explains that what the hackers did only serves as a reminder to these women that “no matter who they are, they are still women. The are forever vulnerable”. In a brief and passionate speech (above), actress and activist Laverne Cox discusses her experience being a transgender woman of color and illustrates how intersecting issues of transphobia, racism and misogyny can play out in public spaces. 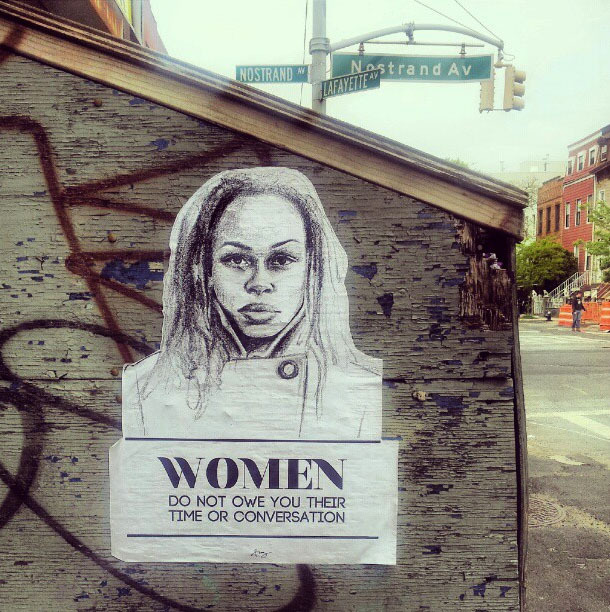 When Ms. Cox shares a past experience with street harassment, she attempts to highlight the precarious position in which she, and other trans women of color can sometimes find themselves. Ms. Cox ends the speech by suggesting that love may be a solution to putting an end to these types of incidences and quotes Cornell West who says “justice is what love looks like in public”. In recent years, we seem to be hearing an increasing number of stories about violence perpetuated against transgender and gender non-conforming individuals as well as heart-wrenching accounts of young people who feel alone and hopeless and end up taking their own lives. These awful stories from our LGBTQQ community only add to a catalog of other similar stories of public harassment, violence and discrimination against racial and religious minorities. As someone who spends a lot of time thinking about how to create safer public spaces (our streets, parks, plazas and other gathering places), I wonder how these experiences can inform better urban planning, policy and design and how that design might contribute to the safety of our most vulnerable populations. Existing design guidelines only take us so far. For example, public space design guidelines attempt to promote design strategies that create spaces inclusive of a wide variety of users and modes of transportation, but often fail to address social issues like gentrification. Other guidelines attempt to improve environments for specific reasons (like creating permeable surfaces for water retention or constructing a protected bike lane); or specific populations, often those with physical challenges (like the deaf community who orient themselves through vision and touch or seniors who may have fluctuating levels of mobility). These kinds of recommendations are an exciting addition to the world of urban design but they don’t necessarily address more comprehensive safety issues. First, I want to take the opportunity to acknowledge my own limitations in discussing this work. I am a white, straight, able-bodied, cis woman, and I recognize that these attributes shape my outlook on the world. Additionally, I understand that my personal experiences, specifically my level of comfort in a public space, are not universal experiences. These statements may seem obvious but it may be less obvious how these attributes influence my professional work and the lens in which I view policy, planning and design initiatives for the general public. Am I humble enough to listen or try to empathize with the stories of our most vulnerable populations? How often do I think about the struggles of those who have dissimilar experiences to my own and how do I begin to create respectful dialogue with the hope of informing better urban design? Community engagement is an integral part of a successful design process. Engagement can be achieved through strategic outreach like holding public meetings, reaching out to community leaders and taking time to listen to, and collect knowledge from the existing community. But I would also like to suggest that while less effective, design may also be informed through first-hand stories, like the essay and speech above, which are not traditional stories about design. After beginning the community engagement process, conducting research, and thinking more critically and contextually about these issues, how do we then use that information to create more relevant design? It may be helpful to begin by looking at larger issues around safety. As I’ve previously discussed on this blog, my masters thesis investigated deterrents to bicycling for women in New York City. As this project evolved, my questions revolved much less around cycling and more about women’s relationship to safety in the built environment. While interviewing women and reading literature about perceptions of safety, what became very apparent to me is that there is no such thing as “irrational” fears. For example, a handful of women I spoke with told me that they were afraid to ride a bike because they thought someone in a van could pull up next to them and grab them. While this occurrence may not actually be a frequent event, these women’s fears shouldn’t be invalidated because when we understand the context for these fears, we recognize that they represent a larger issue about perceptions of safety that have been informed by personal experience. Instead of dismissing these concerns, we could ask ourselves what elements of urban design could contribute to someone feeling less likely that something like this would happen? In the survey I conducted, the number one deterrent to bicycling for women was riding a bike a night. Some existing literature suggests that women are less likely to ride bikes because they are naturally more risk averse, but I would argue that it’s more likely that negative past experiences and particular circumstances (like traveling with children) make some women less willing to be alone in environments where they are uncertain of their surroundings. So how can we create a safer experience for these women if they choose to ride a bike at night at some point in the future? Well, we know that lighting, visibility and location are some of the factors that can contribute to safer streets and public spaces, so using our previous example, it would not be necessary to design bicycle lane infrastructure that specifically prevents vans from pulling up and grabbing a cyclist off the street, but if we installed a bike lane on a well-lit street with a lot of visibility and foot traffic, we could create a safer environment for riding a bike and in doing so, limit a myriad of other potential safety concerns. It may seem like an endless task to try to identify and document an unknowable number of negative experiences and fears a person may have in our public spaces but I don’t think that’s the point. What if instead, we try to think of one person who is the embodiment of the vulnerability of the Other: someone who has some of the largest physical and social challenges in our society? Maybe by imagining that person in our public spaces, we can inadvertently address the needs and fears of a larger cross-section of users and in doing so, create some of the safest, most well used public spaces possible. What would that person look like? Who would they be? For this purpose, I’d like to try and incorporate some of our earlier examples and suggest that we think of “Joy”, an elderly, black, deaf, transgender woman in a wheelchair. How could Joy more easily traverse a busy boulevard, enjoy a sunny day at the park alone or gather with friends in a public plaza? Through design, how can we make Joy feel safe, provide her with easy accessibility and create a space in which she feels comfortable enough to want to spend time there? What would these spaces look like? Even if we don’t know someone like Joy, she represents some of the voices that should be at the table. Wondering how Joy may interact with public spaces allows practitioners to create environments that contribute to the safety of other underrepresented individuals. Ultimately, we can’t guarantee that our streets, parks, plazas and other public spaces will be able attract with widest spectrum of users, but by attempting to serve the needs of the Other, at least we can say that we tried. Designing public spaces in this way is what love looks like in design. For the last five years I’ve been a transit-dependent person. What this means is that I spend a lot of time on foot, a lot of time standing waiting for buses, waiting for trains, and it may or may not surprise you to know that I experience at least one form of street harassment nearly ever day. There is a spectrum of severity to these experiences but their regularity does not make them easier to endure and their consistency has resulted in a vulnerability that can sometimes feel overwhelming. I’ve never gone unaffected by someone who yells to try and get my attention, intentionally standing back to look at me up and down, walking up to me and putting their faces inches from my own, or honking their horn or making suggestive faces from their car. I often try to brush these experiences off but I know they’ve affected me. When I’m getting dressed in the morning and purposefully choose to wear clothes that hide my body, when I avoid eye contact on the sidewalk, when I rush to get home before the sun goes down, when I choose not to participate in activities that require long trips, when I hold my breath as I see someone walking towards me at night. I know it affects me. I experienced the worst form of street harassment in my previous neighborhood. 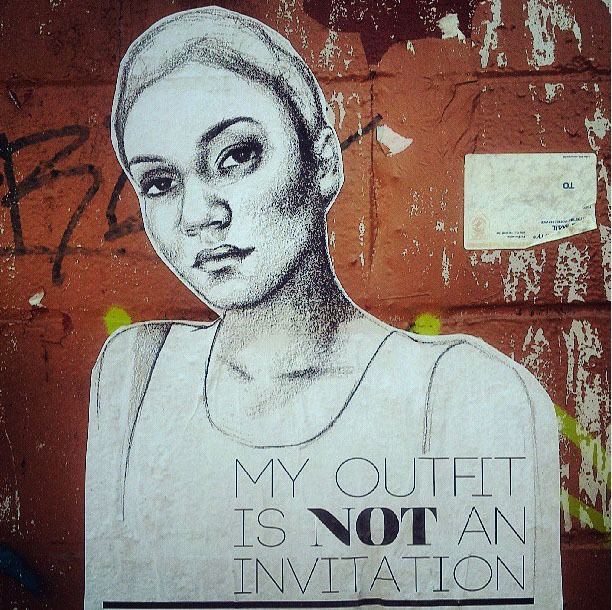 Sometimes I would walk past groups of men seated on the sidewalk who would feel the need to comment on what I was wearing, talk about my body, or inform me that I’d be prettier if I just smiled. Sometimes these men would have the audacity to become outraged when I would ignore them and they would stand up and yell profanities at me as I walked away. It can be difficult to talk about experiences of harassment but sharing experiences is an important step in raising awareness about the issue. Not only to let those who are being harassed know that they are not alone, but to educate the public about this important issue and reiterate publicly that this is not something that we should just accept as a society. By bringing this work in to the public realm, Ms. Fazlalizadeh creates the opportunity to simultaneously speak to those being harassed, those doing the harassing and those who may not have the issue on their radar. She is empowering those who may feel victimized by giving them a voice and by allowing visitors on her site to obtain her posters for FREE!, she is strategically given those who want to raise awareness about this issue, the opportunity to do so in their neighborhood. In the nine years since he was diagnosed with multiple sclerosis, filmmaker Jason DaSilva has found it increasingly difficult to traverse his beloved New York City. Using an electric scooter to get around his neighborhood, Mr. DaSilva has run in to many challenges including a lack of access ramps at the entrance of shops and restaurants and a nearby subway station with no elevator. City-provided taxi services for disabled persons have to be scheduled one day ahead of time and are often unreliable. The few public taxis that are wheelchair accessible can make traveling around the city easier, but taxi rides can be cost prohibitive. In his short film for the New York Times titled “The Long Wait”, Mr. DaSilva demonstrates how arduous navigating the city in a wheelchair can be. As an experiment, Mr. DaSilva decides to time himself and his friend to see how long it takes them both to arrive at his favorite coffee shop (which is frustratingly only one subway stop away from his station nearest to his apartment). His friend Steve rides the train one stop and arrives at the destination in 13 minutes. After reviewing his public transportation options, Mr. DaSilva decides that the quickest route would be to take the East River Ferry from Brooklyn to Manhattan and then transfer to two different buses. He arrives at the coffee shop in one hour and 43 minutes. 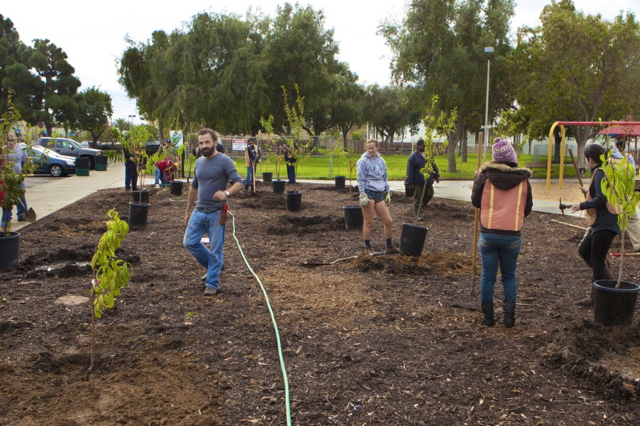 Volunteers plant fruit trees at Del Aire Fruit Park in Hawthorne, CA. Photo via Fallen Fruit. 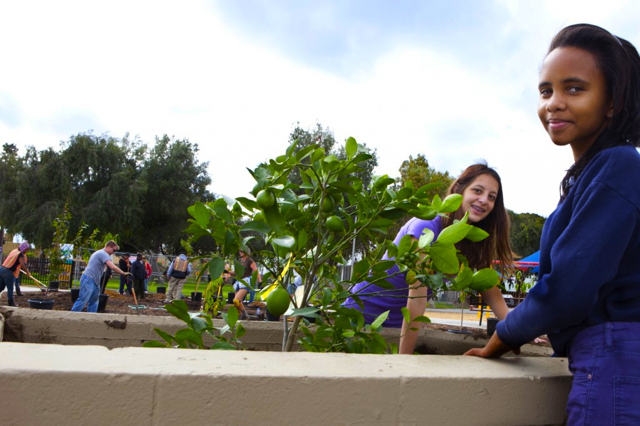 On Saturday, January 5th, a revamped Del Aire Park in Los Angeles’ South Bay was revealed to its neighbors. The new park received $4 million dollars in upgrades to its community center, basketball court, and baseball field and in addition to these upgrades, a grant was secured through the Los Angeles County Arts Commission Civic Art Program to plant 27 fruit trees at the park and an additional 60 fruit trees around the neighborhood. At the opening of the park, Supervisor Mark Ridley-Thomas said that “Community gardens and farmers markets are truly the town centers of our communities,” and they become spaces where the community gets to know one another. These kinds of resources can also be incredible important in neighborhoods that do not have easy access to healthy foods. urban planner. underdog enthusiast. aspirational nomad.